Both Zweig and Budapest find comedy and melancholy in the changing landscape of 1930s Europe, and Anderson is quick to admit his debt to Zweig. The film features two characters meant as stand-ins for the writer—there’s the hotel’s nostalgic, effete concierge, M. Gustave, and the unnamed Author, who appears throughout as a narrator and interlocutor. But Zweig’s influence on Anderson extends far beyond this latest film. Though Anderson says he came across Zweig’s books only six or seven years ago, the pair have long shared similar themes and aesthetics, even if Anderson didn’t know it. But if Anderson likes to invent and inhabit bygone worlds, Zweig actually lived in them, and the sense of loss is more acutely felt in his work. 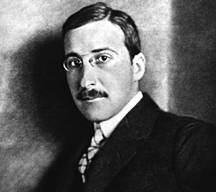 Zweig was a celebrated writer in the U.S. and Europe during the 1920s and 30s, writing over 60 works, including novels, novellas, plays, and biographies. Openly opposed to the Nazi regime, he fled Austria in 1934 for England. Zweig later left Europe entirely, living briefly in the United States before settling in Brazil in 1940. Saddened by the bleak outlook for Europe during this time, he and his wife committed suicide together in 1942. His work soon fell out-of-favor and out-of-print until the 1990s, when several small presses made his work available again in English. Anderson himself, who career as a filmmaker began in the 90s, compiled an anthology on Zweig called The Society of the Crossed Keys, published last year in the U.K.